If you’re a sysadmin who manages multiple Citrix XenApp Farms then this utility is for you. Introducing the NEW CtxAnalyzer which is a great utility for displaying all the information you need about your Citrix XenApp servers in one screen. Now with multiple Citrix XenApp farms view – export information of multiple farms in multiple domains to Excel or HTML files. Server Status: Online or Offline. Windows Information:: Windows Version and Platform (x86/x64), Windows Install Date, Windows Last Boot Date and Machine Uptime. 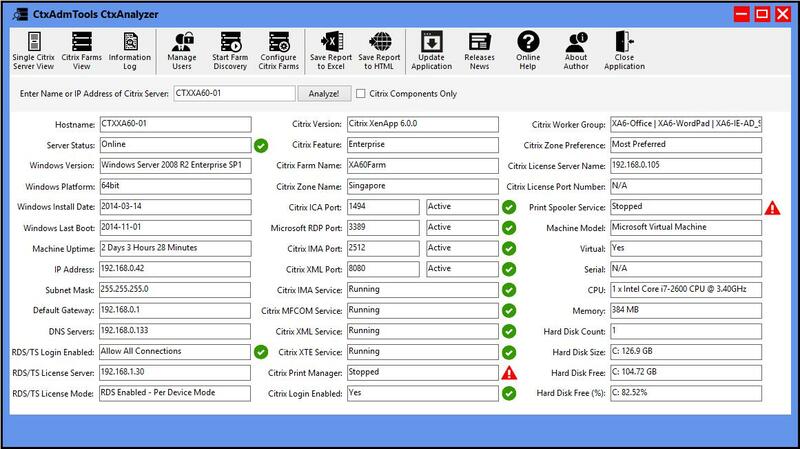 Citrix XenApp Information: Version, Feature, Farm Name, Worker Group, Zone Name, Zone Preference, Citrix License Server and Port and Citrix Logon. Port Number and Status: ICA, RDP, XML and IMA ports. Services and Status: Citrix IMA Service, Citrix MFCOM Service, Citrix XML Service, Citrix XTE Service, Citrix Print Manager Service, Print Spooler Service. Terminal Server/Remote Desktop Server License Server: TS/RDS Logon, License Server(s) name and License Mode. Hardware Information: Machine Model, Virtual/Physical, Serial Number, CPU, Memory, Hard Disk Information. Why not DOWNLOAD and give it a try for yourself.